Most galaxies lie in clusters containing from a few to thousands of objects. Our Milky Way, for example, belongs to a cluster of about fifty galaxies called the Local Group whose other large member is the Andromeda galaxy about 2.3 million light-years away. Clusters are the most massive gravitationally bound objects in the universe and form (according to current ideas) in a "bottoms-up" fashion with smaller structures developing first and larger groupings assembling later in cosmic history. 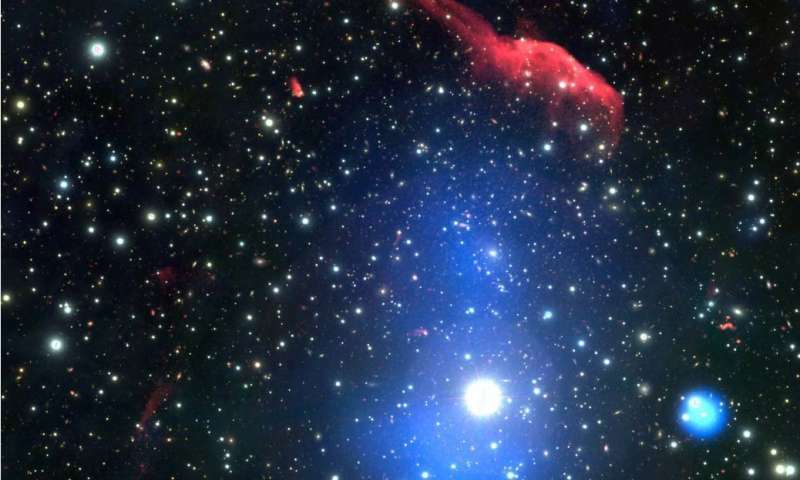 Dark matter plays an important role in this growth process. Exactly how they grow, however, appears to depend on several competing physical processes including the behavior of the intracluster gas. There is more mass in this gas than there is in all the stars of a cluster's galaxies, and the gas can have a temperature of ten million kelvin or even higher. As a result, the gas plays an important role in the cluster's evolution. The hot intracluster gas contains rapidly moving charged particles that radiate strongly at radio wavelengths, sometimes revealing long filamentary structures. The "Toothbrush" galaxy cluster, 1RXS J0603.3+4214, hosts three of these radio structures as well as a large halo. The most prominent radio feature extends over more than six million light years, with three distinct components that resemble the brush and handle of a toothbrush. The handle is particularly enigmatic because, besides being large and very straight, it is off center from the axis of the cluster. The halo is thought to result from turbulence produced by the merger of galaxies, although some other possibilities have been suggested. Credit: van Weeren et al. A multiwavelength false-color image of the "Toothbrush" cluster of galaxies, 1RXS J0603.3+4214. The intensity in red shows the radio emission, blue is X -ray, and the background color composite is optical emission. Astronomers studying the cluster with new radio observations combined with other wavelengths have been able to confirm the galaxy merger scenario and estimate the magnetic field strength in the shocks.